Dawn Jenkins, mother of four-year Oregon Crusaders member Kelsey, submitted this photo and caption. This picture was taken on January 9, 2010 at the U.S. Army All-American Football game. 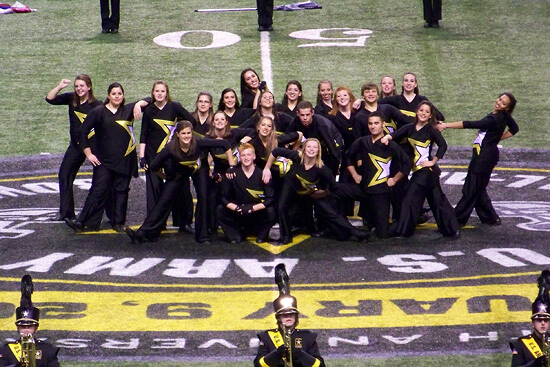 Pictured are the members of the 2010 All-DCI Color Guard in the opening pose. The color guard performed with the All-American Marching Band during halftime of the game. These 22 high school seniors were chosen for the elite guard based on corps experience and other qualifications. Each member flew to San Antonio on Tuesday the fifth, were hosted by the U.S. Army, and over the course of the next three days learned a complete and amazing six-minute field show!